Fiverr is most famous online Freelancing Platform, where people all over the world, offer their services for a specific price starting from $5. Newbies think it very small amount but it is just starting price, you can offer your services on any price say $200. Fiver will deduct 20% of your earned amount as their fee, remaining amount you can withdraw through PayPal or Payoneer. Why do People Fail on Fiverr? Often newbies think they will make a gig on Fiverr and start getting order and making money, but the thinks are not as easy as it seems. 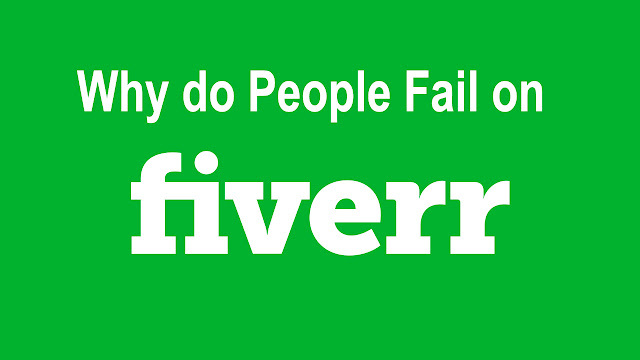 There are many reasons why People Fail on Fiverr. Fiverr is an online business and like any business require proper planning to start, You must have targets what you want to achieve? what are your competitors? How are they getting orders? What is their competitive advantages? Without proper planning Fiverr is a big failure. Try to make your GIG in niche in which other people are getting orders, look at ther tags, description GIG title and try to rewrite it. Getting your first order is the difficult part of Fiverr earning. There are in fact teams and group of people, Software houses which are offering quality services on quick response. So for newbie it is very difficult to get his/her first offer until he/she offer unique or specific service at competitive price. One tip for getting your first order is that use your all allowed GIGs (that is 7 for the time being, including paused, active and GIG under modification) to offer your services. In this why you have 7 times chances that you get your first order. Make a GIG and if it is not working save all details in a MS-Word file so you can re-use it future and delete GIG and make a new with some other services. Use "Buyer Request" menu to offer your services to customer, This option will only be available when you have different services GIG. Buyer requests are very helpful in getting your first order. Often people work late night in Pakistan say 1:00 AM to 5:00 PM get more order because this is US Market time when you find lot of buyer request. You have to be active/online all time or maximum possible time to get orders. Customer prefer to order Freelancers that are online so that they can quickly tell them about their requirements and get their project done, for that purpose keep open Fiverr site when you are on PC and refresh the page frequently so that your status will remain Online, you can use auto refresh chrome extension, but it is not recommend. Here are few of the top services to start your work. Proper requirements of customer should be understood before accepting an order because if you will not full fill customer requirements at the end, Customer gives you bad reviews and that will dangerous for your business, you will face difficult to get more orders in future.